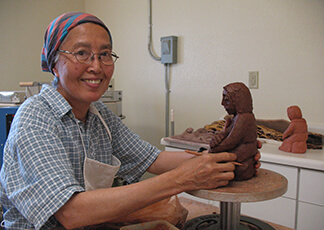 Our sculpture artist here at Santa Rita Abbey, Sister Esther Sawal, OCSO, was born in the Philippines, where she began her religious life in an active congregation. Her superiors sent her to study at the College of Fine Arts of Monza in Milan, Italy. 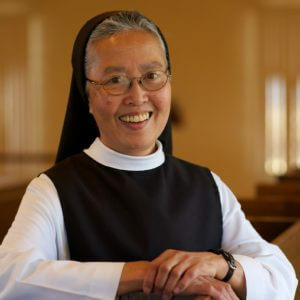 After obtaining her degree, she returned to the Philippines where she worked in liturgical art and church interior design for fourteen years. Her work includes nativity scenes, an image of St Kateri, Scriptural reflections on passages such as the Annunciation, Zaccheus in his tree, the forgiven sinner, the mother and Child. 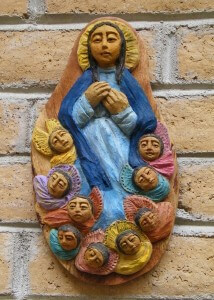 She often incorporates into her designs beautifully worked local wood. Philippine by origin, she has absorbed the culture of the American Southwest, in which her visual artistry conveys profound emotional and spiritual depths. In 1986, in answer to God’s call to a more contemplative life style, Sister Esther came to Santa Rita Abbey in the Arizona desert. Since then she has channeled her artistic talents into sculpture. Over the years she developed a style all her own, a unique combination of her native Filipino culture and the Southwestern-Native American culture she has come to love. Lectio divina, prayerful reflection on the Holy Scriptures, is essential to her creative works. 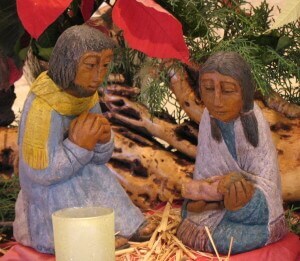 The Gospel comes alive in the faces and attitudes of her subjects: a serene and prayerful Blessed Mother cradling the Infant Christ in her arms, the encounter of the adult Jesus Christ with Zacchaeus or with the Woman at the Well. 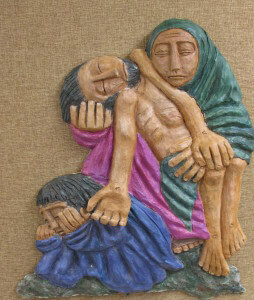 These latter two pieces belong to her “Stations of Reconciliation,” a series of bas relief in fired clay supported by graceful mesquite wood slabs. Over the years Sister Esther’s work has been commissioned by several monasteries and individuals. 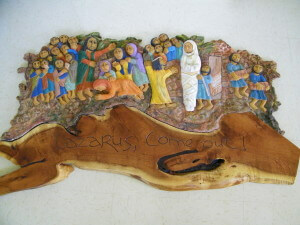 She completed a bas relief composition of the raising of Lazarus in 2014. See the photo on the left below. More recent pieces include the bas relief “Our Lady of the Assumption” in the photo on the right, and a Nativity Set for a Franciscan community. Each of Sister Esther’s pieces is created entirely by hand. No molds are used. Each piece is unique. She often uses pieces of mesquite wood native to Southern Arizona, drawing out the natural beauty of the wood, and incorporating its natural shape into her art work. Her crucifixes are particularly special. 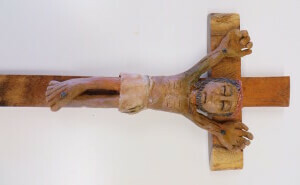 Each wooden cross is one of a kind, and the clay corpus is designed for a particular cross. For more information, please phone Santa Rita Abbey at 520-455-5595, and ask for Sr. Esther.